The genus name Urtica is Latin, and means "I burn." The species name dioica is Latin for "two dwellings" or "two houses," in reference to the plant being dioecious, or bearing male and female flowers on different plants. The common name nettles is thought to derive from the Anglo-Saxon noedl, "needle," in reference to either the use of nettles as a textile fiber or their sharp prickles. Nettles may also derive from the Latin nassa, "net," in reference to the plant's strong stems being woven into fishing nets. Nettles grow just about everywhere, from waste areas and roadsides to gardens, grasslands, and moist woods. This perennial herb has erect, somewhat branching stems and can grow to a height of 3 to 10 feet. The coarsely serrated, veined, opposite leaves are heart shaped at their base, pointed at their tips, darker on their tops than underneath, and covered with thousands of stiff, stinging hairs. The tiny green flowers are minute and inconspicuous. 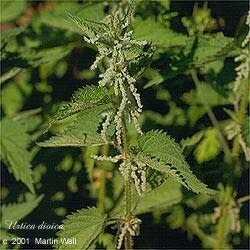 Nettles is dioecious, meaning that male and female flowers are borne on different plants. In the garden, nettle spreads widely and quickly. Where once I had a single plant given to me by a friend, I now have at least a thousand. Nettle can adapt to light conditions ranging from full sun to full shade, loves soil that is high in organic matter, and enjoys moderate to high watering. This is an herb that improves just about everything! David Hoffmann, author of The Holistic Herbal, says, "When in doubt, use nettles." Nettle improves the body's resistance to pollens, molds, and environmental pollutants. It stabilizes mast cell walls, which stops the cycle of mucous membrane hyperactivity, and it nourishes and tones the veins, improves veins' elasticity, reduces inflammation, and helps prevent blood clots. It also helps curb the appetite, cleanses toxins from the body, and energizes, making it a motivating ally for those who seek to stay on a healthy diet. Drinking nettle tea before and after surgery helps build the blood, promotes healthy blood clotting, speeds recovery, and helps the patient reclaim his or her energy. Nettle is used in the treatment of acne, amenorrhea (due to blood or kidney deficiency), anemia, arthritis, asthma, atherosclerosis, boils, bronchitis, candida, catarrh, cellulite, cystitis, diabetes, dysentery, eczema, edema, food allergies, hay fever, headache, hemorrhage, hemorrhoids, hives, hypoglycemia, infertility (men and women), jaundice, kidney stones, leukemia, lumbago, menorrhagia, mononucleosis, nephritis, night sweats, obesity, pleurisy, postpartum hemorrhage, premature gray hair, psoriasis, rheumatism, rickets, sciatica, sinusitis, tuberculosis, varicose veins, and vitiligo. It is also an excellent herb to encourage convalescence. The nettle plant's individual parts have some targeted uses. Nettle leaf and root in particular are known to tone and firm tissues, muscles, arteries, and skin. Taken internally, they decrease uric acid buildup and increase circulation to the skin's surface. The leaf can be used to prevent hair loss, while the root is used in the treatment of prostatits. Nettle seed both detoxifies and improves the ability of the liver and kidneys to cleanse the blood. Because of this, it is an antidote to poisonous plants and also is useful in cases of spider, bee, dog, and snakebites. It is also used in the treatment of erectile dysfunction, goiter, and hypothyroidism, and it can be used to prevent hair loss. Nettle is also used for the practice known as urtication, in which one intentionally stings oneself with the plant. This practice, which dates back at least two thousand years, induces a rush of blood to the stung area, producing a counterirritation that reduces inflammation and provides temporary pain relief. Urtication energizes the nerves, muscles, capillaries, and local lymphatic system and causes the body to secrete antihistamines. It can help relieve the pain of arthritis, coldness in the extremities, gout, lumbago, muscular weakness, multiple sclerosis, neuritis, palsy, rheumatism, sciatica, and tendonitis (chronic). Topically, nettle can be used as a hair rinse to treat dandruff and hair loss, a cleanser for oily skin, a sitz bath for hemorrhoids, a wash for sunburn, a douche for vaginitis, and an enema for detoxification. Compresses prepared with nettle tea can be used to treat arthritic joints, burns, chilblains, eczema, gout, heat rash, insect bites, mastitis, neuralgia, rash, sciatica, tendonitis, varicose veins, and wounds. Nettles could be described as a superfood, being extremely nutritive, even more so than spinach. Nettle greens can be substituted for cooked spinach, beet greens, chard, or turnip greens in any recipe. Before they can be consumed, however, the sting must be deactivated. Cooking the nettles will do so, as will pureeing the nettles or drying and powdering them. Nettle beer and wine are favorites of many homebrew aficionados. Fresh nettle juice can be used to curdle cheese, thereby replacing rennet and making a vegetarian-friendly cheese. The juice is also a super tonic beverage. When stored with fruit, dried nettles can make the fruits last longer, be more resistant to mold, and maintain their flavor better. Nettle leaves can also be wrapped around apples, pears, root vegetables, and moist cheeses to deter pests and aid in their preservation. Nettles have been used to make paper, rope, fiber, and even a dark green dye. They have many uses in the garden. When used to water plants in the garden, nettle tea stimulates their growth and makes them more resistant to bugs. Plants growing close to nettles tend to have more potent levels of volatile oils. And when added to the compost pile, nettle hastens the breakdown of organic materials. All fifty species of the genus Urtica can be used medicinally, but stick with the urens and dioica species unless you have consulted with local herb authorities on the safety of local varieties. Nettle is not known as stinging nettle for nothing; avoid touching or eating the fresh plant unless it is very young and/or you are very brave. Touching the fresh plant can cause a burning rash. Wearing gloves when collecting can help prevent this, but the hairs in large plants may still pierce through. A nettle sting can be soothed with a poultice of yellow dock or plantain or even the juice of the nettle plant itself (but good luck obtaining this without getting many more stings). However, you can learn to love the sting. I admit to collecting nettles barehanded with a pair of scissors and a paper bag. The arthritis I was developing twenty years ago has now become a thing of the past and I attribute its disappearance to nettle stings. Eating raw nettles can cause digestive disturbances, mouth and lip irritation, and urinary problems; however, these side effects are rare when the plant is pureed before ingestion and practically nonexistent when the plant is dried. When used appropriately nettle is considered safe, even over an extended period of time, although those with overly cold, yin-deficient conditions should not use nettle for prolonged periods. Only the aboveground portions of young plants should be consumed, as older plants can be irritating to the kidneys and may cause digestive disturbances.